Hey peeps, past the half way point of the week- the weekend is creeping closer. So those who follow me on twitter (@raywhoisshe) will know that I'm having some hair issues. Feels like my hair is moulting loads and loads- bizarre. Might just be me though. 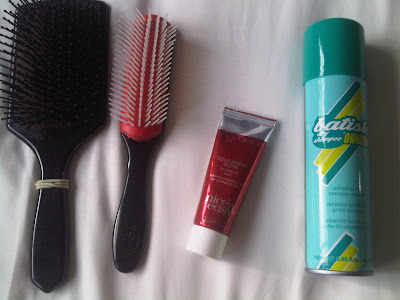 So what hair stuff can't I live without?? Paddle brush- use to attempt to smooth my hair when blowdrying it, this is my main brush. Denman brush- used for backcombing on a night out. Clarol nice and easy colour protect conditioner- got this the other week from Sainsburys for 50p. This has really kept my colour in my hair- you can get it for blondes and brunettes. Really recommend it. And finally batiste- it needs no explanation (get it from home bargains only 99p). Shampoo wise- Aussie Colour Protect. My two favourite hairsprays silhouette by schwartzkopf (cousin has her own hairdressers, so I got this for free)- normally use this on nights out when I curl my hair. Amazing- not sticky, shame you can't get them in travel sizes. 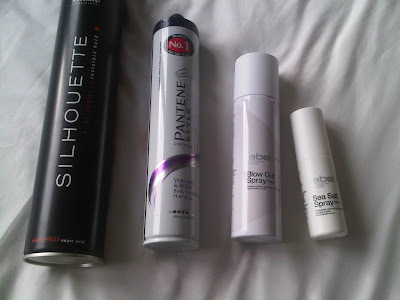 Pantenne Volume and Body- this is my everyday hairspray, quite sticky, but does the trick. Label M blow out spray- £10.50 from Toni and Guy, this gives massive volume as well as being a heat protect spray. Normally use this when I'm curling my hair, warning it makes your hair quite knotty when your drying it. Label M sea salt spray- £3.50- this is the best sea salt spray I've used. Normally use this when I'm letting my hair dry naturally. For some reason lately when my hair dries its going quite curly (still looks like I've been pulled threw a hedge though), also use it for texture when my hair is curled. 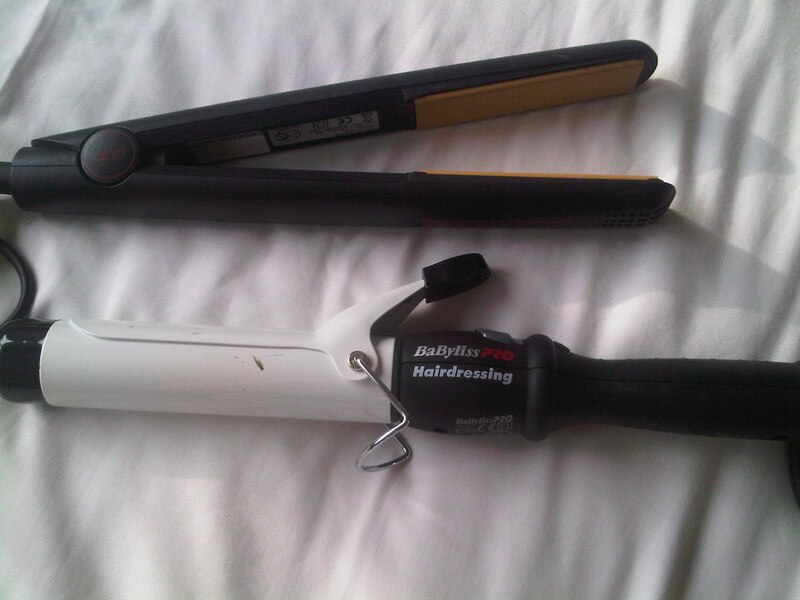 My mighty mighty GHDs- I can't remember life without them. These are my third pair- my brother broke the first pair, he got my second and now I have these. Debating whether to get the large plated ones though. Babyliss Pro Hairdressing 32mm barrel tongs- bought these from Sallys for £30- these get really really hot. Yes thats black nail polish on them- they melted my polish one night before I went out. Really good for doing loose curls, always do my extensions first, then curl sections as I clip my extensions in. My pride and joy- my beloved hair extensions :) dyed to match my hair colour. You can see the red in them, but I couldn't capture the colour properly. I got these from Additional Lengths in Stockton- £12.50 (www.additionallengths.co.uk) for a 18" weft with 5 clips on. 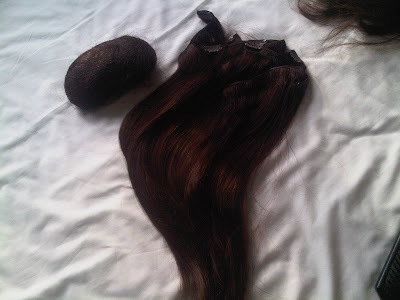 I have to say these are the best quality of real hair extensions I have used- the hair is so thick. I only need 3 wefts in, although I always wear 4. Everyone laughs when I tell them I wear them, cause they're only 2 inches longer than my natural hair. Can't go on a night out without them. Foxy Locks Instant Beehive- £4.99 (www.foxylocksextensions.com), I use this if I can't be bothered to back comb my hair for beehives and Beyonce esq quiffs. All what you do is pull you hair over it and secure with kirby grips. great post, and seriously your so lucky that you can get your hair done for 15 quid that is amazing!